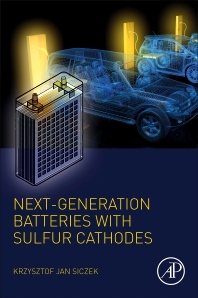 Next-Generation Batteries with Sulfur Cathodes provides a comprehensive review of a modern class of batteries with sulfur cathodes, particularly lithium-sulfur cathodes. The book covers recent trends, advantages and disadvantages in Li-S, Na-S, Al-S and Mg-S batteries and why these batteries are very promising for applications in hybrid and electric vehicles. Battery materials and modelling are also dealt with, as is their design, the physical phenomena existing in batteries, and a comparison of batteries between commonly used lithium-ion batteries and the new class of batteries with sulfur cathodes that are useful for devices like vehicles, wind power aggregates, computers and measurement units. Dr. Siczek is a Master Engineer in Mechanical Engineering, with a specialization in Cars and Tractors at Technical University of Lodz, Poland. He teaches Automobile Mechatronics at the Lodz Centre of Excellence for Teacher Training and Practical Training. He is also a Lecturer in the Department of Machine Design and Exploatation/Department of Precise Design/Department of Vehicle and Fundamentals of Machine Design. Responsible for teaching of Descriptive Geometry, Technical Drawing, Informatics, CAD. His current research focuses on selfstarters, valvetrain elements, shock absorbers, loom mechanisms, and properties of composites.